PROPERTY MANAGEMENT CONVENTION SET FOR SEPTEMBER « Global-Link MP Events International Inc.
A national convention on property management is set for September 22 and 23 at the SMX Convention Center Manila, SM Mall of Asia Complex. 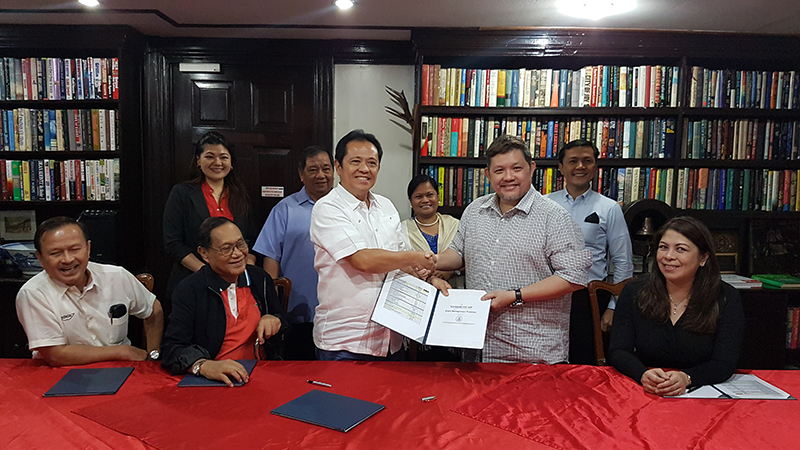 It is spearheaded by the Philippine Association of Building Administrators (PABA) and will be managed by Global-Link MP Events International, Inc. In the photo, PABA President (left) Jeffrey Sosa shakes hands with Global-Link MP CEO Patrick-Lawrence Tan as the two sealed the deal for the September event. They are joined by PABA’s board of directors (standing, L-R) Hershey D. Caballero, Corporate Secretary; Engr. Julian G. Bay, Treasurer; Josephine B. Matalobos, Chairman-Education Committee; Allwin M. Wagan, Public Relations Officer; (seated, L-R) Stalin T. Lagman, Vice-President, Ways and Means; Atty. Francis S. Serrano, Legal Counsel; and Jing Lagandaon, Global-Link MP Chief Operating Officer. The convention coincides with the National Building Management Industry Week, which was proclaimed by His Excellency Joseph Ejercito Estrada on September 4, 1998 (Presidential Proclamation No. 12). Close to 500 property owners, managers, and administrators are expected to attend the said event. Interested attendees and sponsors may contact the Convention Secretariat at 893-7973 local 317 or email info@globallinkmp.com.